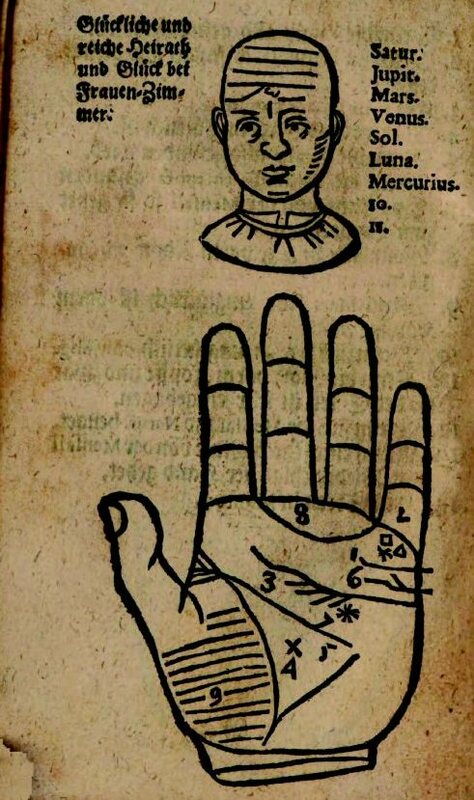 some months ago I'd translated one of J. Hartlieb's plates in English that international palmists may get an impression of the oldest ever printed palmistry / chiromancy book. These times we live in now may seem tough, but life in the middle ages looked pretty gloomy in the writings and artwork that survived. Johannes Hartlieb, "Die Kunst Chiromantia", written in 1448 AD, printed a little bit later. The plates are around 45 woodcuts without numbers of the pages. The translated is one of it. I own a reprint. If you would like to have a reprint, I'll sent you one in unreadable German. I was joking about the name of the plate because the predictions were so gloomy. ...thank you, now I understand what you've meant. I'll correct the translation and may be I'll translate another plate for you (in 2 1/2 weeks my summer break is ahead). Manfred wrote: ...thank you, now I understand what you've meant. I'll correct the translation and may be I'll translate another plate for you (in 2 1/2 weeks my summer break is ahead). I have excamined the book again and found it not really worth to translate more. but another could be really interesting. Here the picture with themes some members of a special country are usually very interested in . The head line is: "A happy and prosperious wedding and luck with wives". Out of Joh. Hoeping, Institiutiones Chiromanticae, Jehna (today we write Jena), Germany, 1673 AD. 1. A happy line on the place of wedding (marriage). 2. If we find a quadrangel, triagle or star on the mount of Mercury. 3. If the table (the place between the heartline and the headline) has the same width between every place. 4. If a big X is in the cave of Mars (the middle of the palm). 5. If there is a happy (good) triagle. This means that there are no crisscross lines or warts at this place. 6. If there is the line of Mercury at the place of wedding (marriage) does it mean that he`ll marry his friends of blood. 7. A star in the quadrangle beyond the table under the mount of Sun. 8. If the Guirdle of Venus is perfect. 9. If the mount of Venus (thumb) is happy (in good condition). That means that it have a fine high and small lines on it. 10. If the lines of Venus and Sun on the forehead are in conjunction. 11. If the Venus is in a good condition on the forehead. 12. If the line of heart is good: long, wide, with a lively colour and if there are little twigs on the line of heart. Thanks again Manfred for sharing! These are fun to look at! 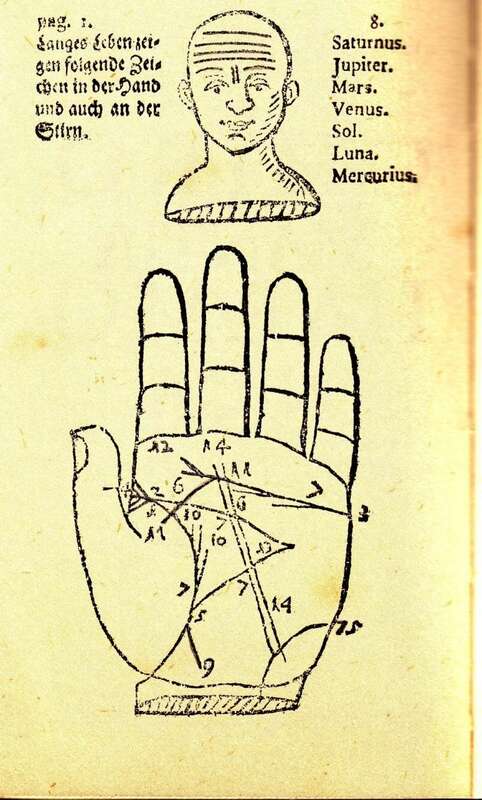 Would you mind if we break away these few comments from this thread on Indian Palmistry and put it in a new topic of it's own? That way if someone wants to find them again they will be able to by looking at the topic titles. If so, what should I call it? 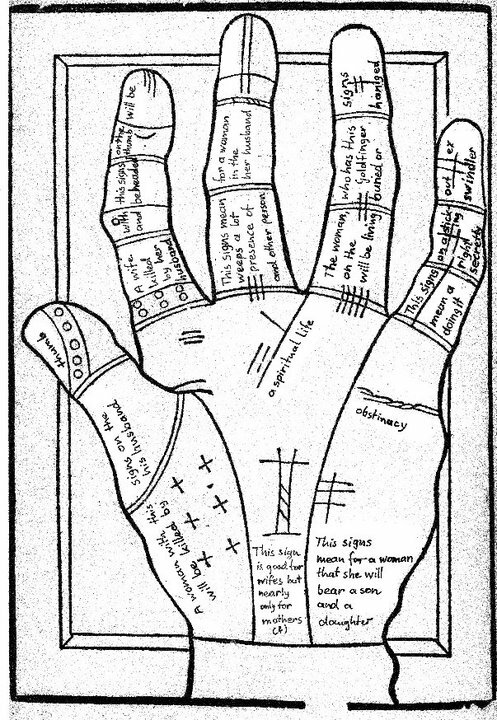 Does "English Translations of Fourteenth Century German Palmistry Text" or something like that sound ok to you? ...If you think it would be better to put it in on another thread than: Please. As you are the palmistry princess I agree with all head lines you would prefer. the second (Hoeping) was first printed in the 17th century. It would be shurely interesting to translate some more of the second. I hope I'll find the time when I leave school in two years. Manfred wrote: ...If you think it would be better to put it in on another thread than: Please. As you are the palmistry princess I agree with all head lines you would prefer. I have moved them here to the History section. In the image are they comparing facial features to hand features? Such as a certain facial feature has the same implications as certain hand features? ...He didn't really compare the lines on the forehead with the lines in the hand, but he used relations between them. This was common in the Renaissance. It's a part of physignomy. The old chiromantists or doctors (usually they were doctors) assigned the lines on the forehead to the (7 old) planets, beginning on top with Saturn as you'll find the description in the picture on the right side on top. The Sun line is upon the right brew, the Moon line above the left brew, the Mercury line between the brews vertically. In generally the right body side and hand belongs to the Sun the left to the Moon. Manfred wrote: ...He didn't really compare the lines on the forehead with the lines in the hand, but he used relations between them. This was common in the Renaissance. It's a part of physignomy. That's interesting. I asked because recently a friend sent photos of someone's hands to me and they looked very familiar reminding me of another friend's hands in general appearance. When we shared photos of them it was very fascinating how similar they looked. it's 15. The name of this in old chiromancy books is not lasziva but Via lactea. That means milk line. In a book of the early 1920ies I also found "Via milky way". In the book above this line 15 isn't a sign of something bad but also a positive mark for a long life. In another plate I found it explained or named as a Mercury line. Interesting too: The starting of the Mercury line in the Vitalis (Venus line) here in the plates is a positive mark. Another detail: The sister line of the Vitalis (doubble life line) is called Mars line. Is there a label for line 75 that arcs from the wrist toward the percussion? ....sorry Patty, I did something wrong and had to put the third picture in again above. Thank you Manfred! 75 did seem like a large number, now I see it is 15!